Accurate construction of most furniture assemblies – frames, carcasses, post-and-rail construction, and drawers – usually involves 90° angles. “Square” is a big part of woodworking. Parallelograms, we do not want. You can work faster, and don’t need to remember numbers. You will get a more intuitive sense of the magnitude and direction of the error. Most important, you will see immediately how to correct it, especially during glue up. 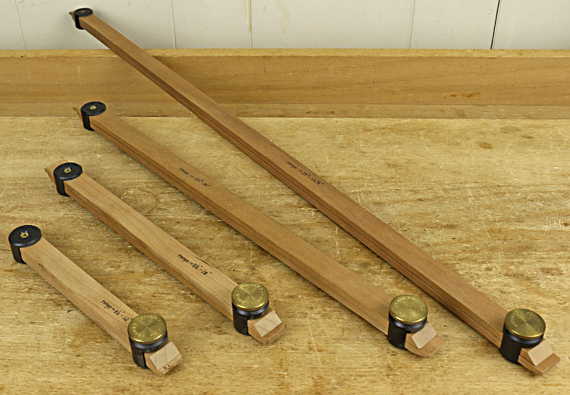 I have been using this set of pinch rods for more than 20 years, which I made with collars manufactured by Veritas. I recommend these because they simplify construction, and the result is a lightweight, low profile tool that is quick and secure to clamp, and adjusts smoothly. Veritas supplies basic construction instructions but here are a few tips. 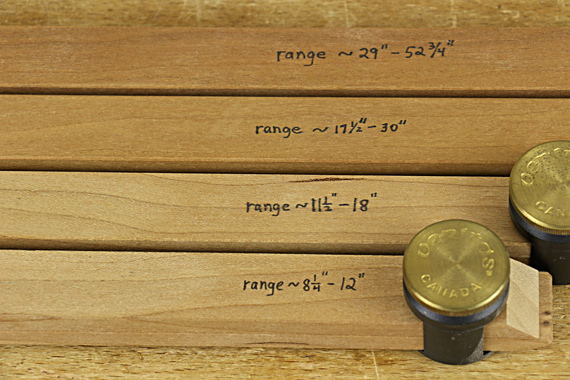 You’ll want to build a set of rods, so keep in mind that the shortest length a pair of rods can measure is at least 1″ longer than the individual stick length, while the longest measurement will be about twice the stick length minus 3″. A 40° chisel-like business end works well, but contrary to Veritas’ instructions, I suggest orient the pair of sticks so the bevels face away from each other, toward the outside, as seen in the photo below. In use, the beveled side should always face the shorter side of the rectangular assembly. Thus, you will rotate the stick 180° along its length to measure the other diagonal. This allows the tool to manage even the narrowest rectangles. The storage position is shown in the photo below. The non-working blunt end protects the sharp-beveled working end. I prefer to apply the gentle accuracy of these wooden rods instead of metal ones on cleaned up work. Nearly always, you will be measuring from the inside of the frame or carcass because the other parts of the assembly will interact with the inside surfaces and angles, not the outsides. For very large assemblies, a tape measure, perhaps with the special tip made by Veritas, or an ad hoc pair of rods, is more practical than having a giant special pair of rods. To make a parallelogram into a rectangle, there is a simple rule to remember: shorten the long diagonal. 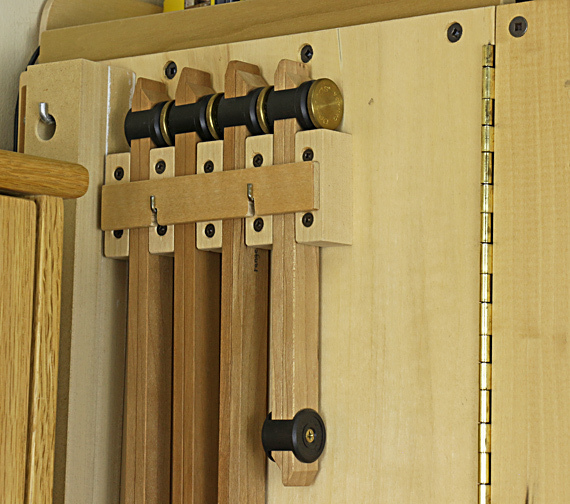 For dry assembly, this may mean tweaking the joints, such as trimming tenon shoulders in a frame or post-and-rail construction, or simply adjusting the positions of the clamps. During the crunch time of glue up, remember: angle the clamps to be slightly more along the long diagonal, as if you are trying to scrunch it shorter. I am always amazed at how little clamp adjustment is necessary to square up the assembly, especially using heavy clamp pressure. Don’t overdo it. Sure, you did a meticulous layout and cut great joints – dovetailed that drawer, mortise-and-tenoned that frame – but somehow when it all goes together the evil forces still manage to sneak in. Assess and correct it with pinch rods. You might even want to make a nifty rack to store them. 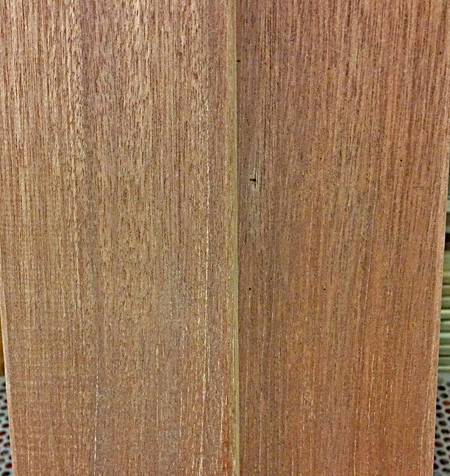 Dark red meranti, pictured above, is a generally uninspiring reddish brown, rather uniform looking wood that does not therefore find its way much into fine woodworking. If you have not come across it as solid wood, you likely have seen it as the skin of middling quality plywood, where it is referred to as lauan or Philippine mahogany. It is about the same density as khaya and genuine mahogany, but a bit softer. It has several cousins in the Shorea genus, including the softer and even more forgettable light red meranti. Any claim of these woods as “mahogany” is untenable. There is, however, one more wood that does have a strong claim as a mahogany substitute: utile, also known as sipo. Entandrophragma utile is in the same genus but not as hard as sapele, and easier to work. It is a generally consistent but not boring wood that can look quite nice, especially flatsawn, where you otherwise might have used genuine mahogany. Its darker ray lines sometimes also add interest. I’ve also seen some wild ribbon striped quartersawn utile. The volumetric shrinkage of utile is 11.8%. That’s pretty good but no match for genuine mahogany’s freakish 7.5%. Still, with a nice T/R of 1.4%, you can expect utile to behave quite well. Consider each on its own merits rather than trying to imitate some other wood, namely “genuine” mahogany. Pay close attention to the particulars of each board, including color, density, figure, and, of course, the orientation of cut from the log. There is much variation within each species. Watch out for defects, especially compression failures. For this reason, and the point above, consider buying these woods planed or at least hit-or-miss planed if you can. Scraping is a good way to tame the interlocked grain on quartered surfaces. Sapele, Entandrophragma cylindricum, stands out as significantly darker, redder, heavier, and harder than the others in this bunch. Though it would often work in the same context as genuine mahogany, I suggest not thinking of it as a substitute for the venerable old boy, but rather as a wonderful wood in its own right. The species offers some spectacularly figured wood. 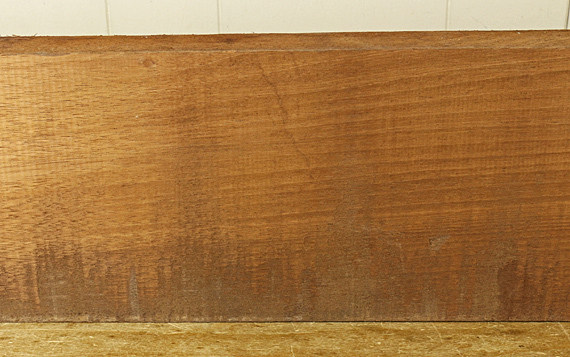 Most common is the neat ribbon stripe in quartersawn boards. The striping is finer and bolder than that of khaya, and can be obtained quite reliably. The pieces pictured above are unfinished, fairly middling stuff, but the ribbon figure will pop pretty well with oil-varnish mix, and the color will deepen considerably. Also, consider ribbon-stripe face veneer plywood, which can be found reasonably priced in a variety of thicknesses, as a nice backing for a cabinet or for drawer bottoms. You know a wood has reached all-star status when you see it as fake veneer in an elevator in a fancy downtown building. Sapele can also produce spectacular curly figure and pommele figure. The latter is similar to blister maple, sometimes in a finer pattern. The wood is popular with instrument makers. On the other hand, flatsawn sapele, without special figure, is a decent wood but not something that really excites me on its own. Still, it may fit the bill as a predictable, diffuse-porous, reddish wood that can finish fairly dark and will darken further with time. No pushover like genuine mahogany, sapele is about as hard as white oak and sugar maple, and nearly as dense. 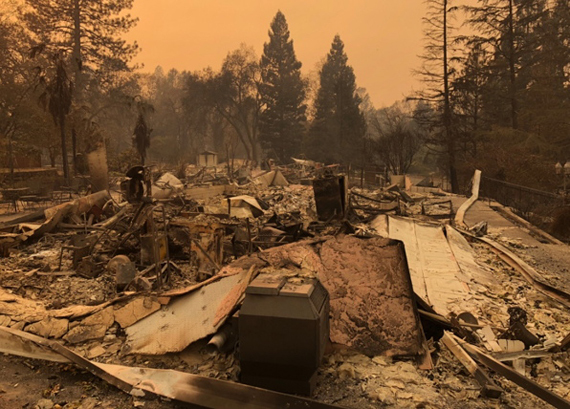 It machines pretty well as long as you take precautions to avoid planer tearout on the quartered rowed surfaces and burning from ripping on the table saw. 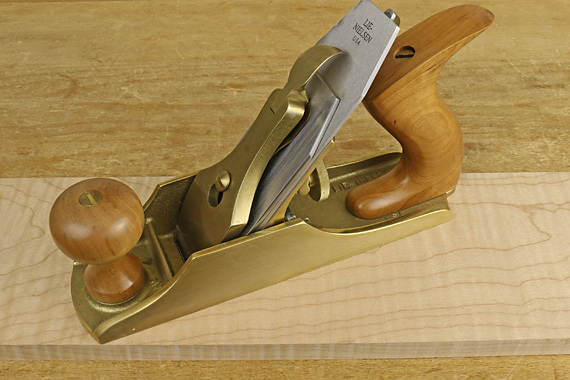 For smoothing to a finished surface, I suggest skip the handplane and go with scraping and sanding. 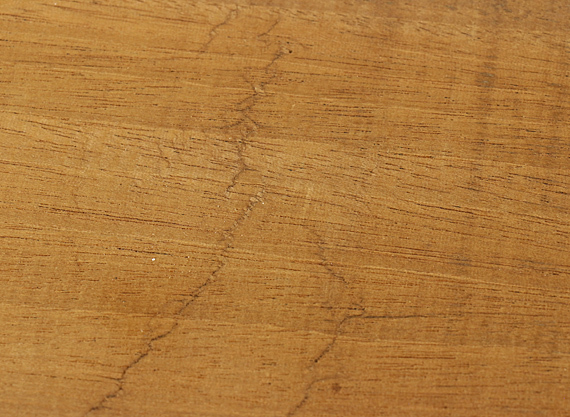 Sapele is about as stable as black walnut, with a volumetric shrinkage of 12.8%. The T/R is a nice 1.5, but that offers little advantage when using quarted boards for the ribbon stripe. Shopping at different dealers, I’ve had good luck with the sapele being fairly consistent, and it has seemed safe to buy in the rough. (However, check the comment in the first post in this series – compression failures may lurk.) I’ve also found it more expensive than khaya or utile but still significantly less than genuine mahogany. It is a popular wood. How do you pronounce it? I’d been saying sa – ‘pay – lay (like the legendary soccer player), but most often I hear sa – ‘pee – lee, and sometimes, sa – ‘pell – lee. There’s one more post coming up in this series. Next up is khaya. The wood available to us may be any of four species in the Khaya genus: K. ivorensis, K. grandifoliola, K. anthotheca, and, less so, K. senegalensis. Ask the guy at your lumber yard what species he’s selling and he’ll probably look at you the same way we look at an 88° try square, even if the importer had kept the species distinct. In fact, you’ll probably create confusion by asking for the “khaya” bin because it is more commonly referred to as African mahogany. And so, this is the only wood comparable to genuine/true mahogany (Swietenia) that generally bears the “mahogany” name. Botanically, it is in the same family (the next major grouping above genus), Meliaceæ, as Swietenia. It comes to us from West African countries. 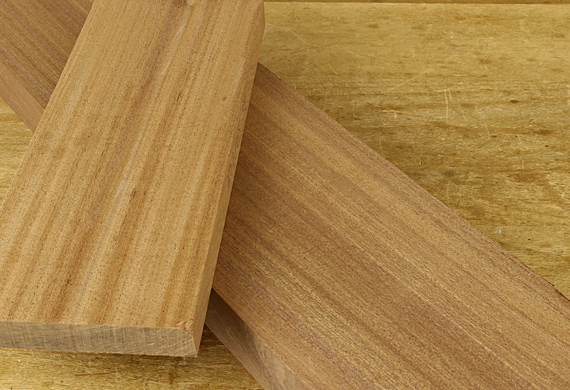 Just like true mahogany, when African mahogany/khaya is good, it is indeed a very good wood. The problem is that I have had just as much frustration with inconsistency in density and color in khaya as with true mahogany. There is variation among species, but also with the geographic source of the tree, and the local conditions in which it grew. Therefore, as a practical matter, I suggest that you not be too concerned with the provenance of the wood, but evaluate each board on its own merits. 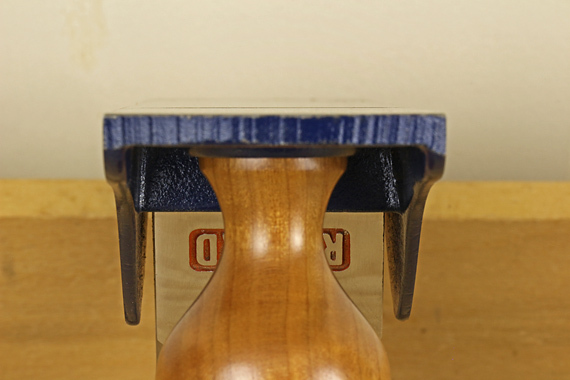 Khaya is about half the cost of true mahogany, and there is some great stuff available. Some khaya is less dense, and quite light in color – an uninspiring pale pink hue. The flatsawn wood looks particularly anemic. 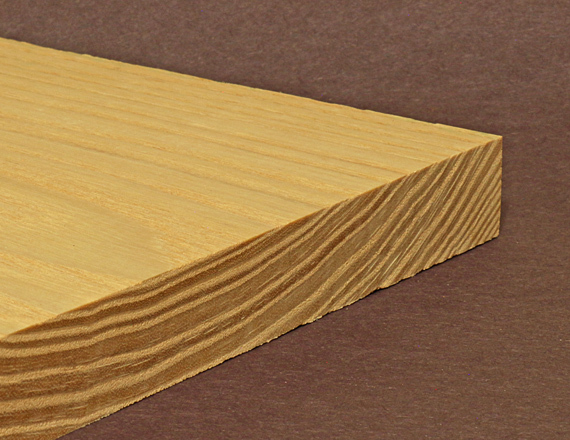 When quartersawn, these boards often have a hairy surface that can be difficult to finish. They come off the planer with hairy rows that are hard to tame with planing, scraping, or even sanding. Good flatsawn khaya is also very worthwhile. In some case, it is difficult to distinguish from high quality true mahogany. In general though, I’ve found that true mahogany’s legendary chatoyance is harder to find in khaya. Unfortunately, khaya seems to be quite susceptible to the dreaded compression failures that I discussed in reference to mahogany in the previous post. 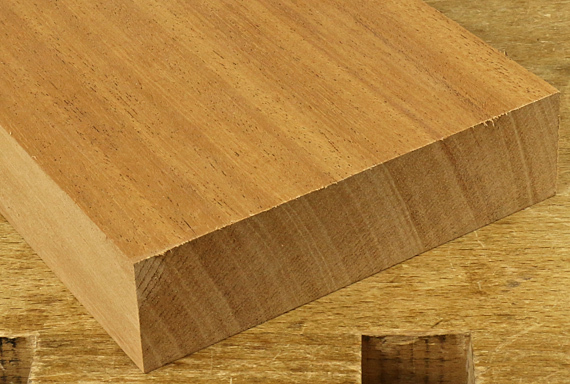 With the possibility of these defects, as well as the great variation in the other properties of khaya, I suggest buying your boards S2S planed or hit-or-miss planed, if possible. Look them over carefully. 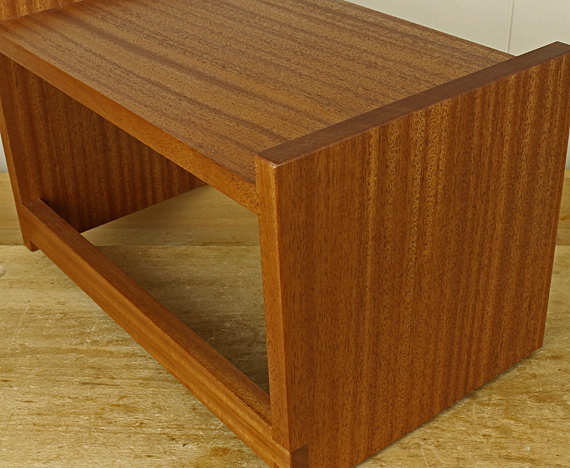 Coming up: sapele and others. Fasten your seatbelt as we ride through the world of mahogany! Our tour will be mostly about woods that are similar to mahogany, and sometimes referred to as “substitutes” for it, but are better considered on their own merits. Note that in the rear-view mirror is Swietenia mahogani, aka Cuban mahogany, the best of them all, once used for building ships and furniture, but long since essentially unavailable. You might find a bit of it for sale that was rescued from the occasional tree downed in a storm in south Florida, and there is a plantation operation on a South Pacific island. I once read that it works like “cold butter,” and having had a tiny piece of the stuff some years ago, I can confirm that description. But back to S. macrophylla. When it’s good, it has a lot going for it. 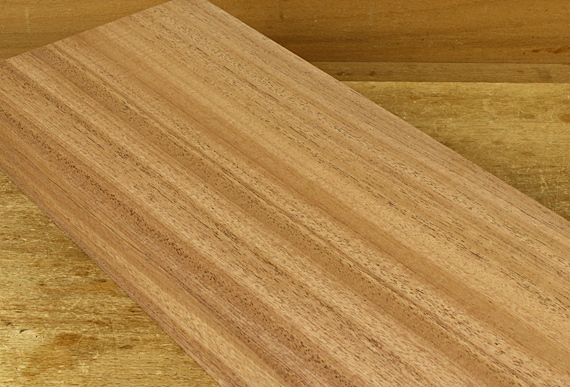 Boards with good density and color are a pleasure to use in your projects. 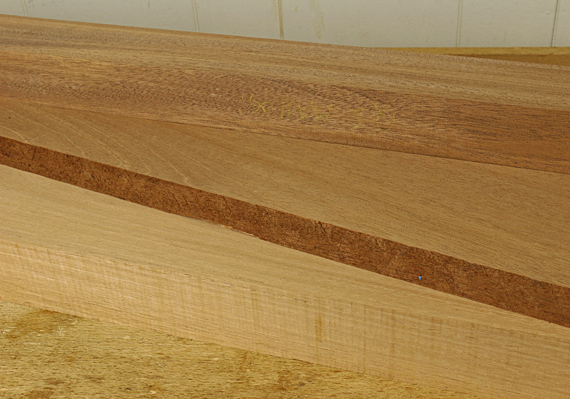 It usually planes easily on the flatsawn surface, while the quartersawn surface often exhibits attractive “ribbon-stripe” figure due to interlocked grain. This is difficult to plane but quite manageable with scraping and sanding. The wood is soft enough to saw and chisel easily but firm enough to hold detail. The stability of mahogany is legendary. Radial shrinkage is 2.9%, tangential 4.3%, yielding an excellent T/R of 1.5, and paltry volumetric shrinkage of 7.5%. Then there’s the chatoyance – that wonderful shimmery gleam, lovely but not overpowering – that mahogany does so well. You know, classy. A shellac and wax finish looks great. Unfortunately, big-leaf mahogany is a big pain in the neck. Why? First, because it is expensive. I cannot find even the drabbest mahogany for less than $10 per board foot. Yet it is extremely variable in quality. Some boards in the bin will have that nice density and color, while others are junk wood – light in color and density, or often with defects. 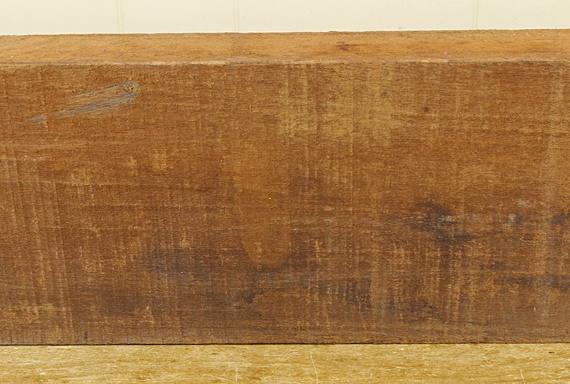 In fact, I suggest avoid buying mahogany in the rough; look for S2S or hit-or-miss planed stock. In the photo at top, all three boards are genuine mahogany. Yup, the real thing. The top one resembles sapele (more on that in an upcoming post), the middle board is what I consider nice flatsawn mahog, and the bottom one is genuinely trash wood, as far as I’m concerned. The most notorious defects are compression failures, sometimes called “windshakes.” These are jagged cracks across the grain, usually through the full thickness but not the full width of the board. The fibers are broken, rendering that part of the wood useless. It occurs in the tree from severe wind forces, snow loads, or, what I suspect is mostly the case with mahogany, when the tree is felled. Beware: this defect is very difficult to notice in rough boards, where it lurks to disappoint you when you bring the wood home and plane it. See the defect in the board below? No? Neither did I before I took it home. Here is the other side of the board, with the compression failure clearly visible after I skimmed it on the jointer. The defect goes through the full thickness of the board. S. macrophylla is listed in CITES Appendix II, and on the IUCN Red List as Vulnerable. We are probably encountering mostly plantation grown wood, and the quality is uneven at best. And so, regrettably, mahogany is nearly off my list of good options for wood. 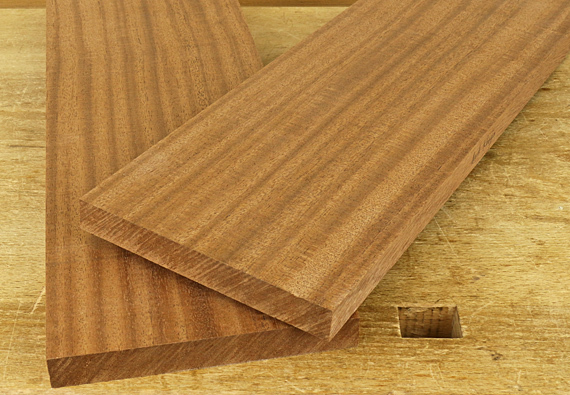 Next, we’ll look at a common alternative, Khaya, aka African mahogany. There’s that word again. Double-coated tape earns Shop Miracle status for its simplicity and problem-solving versatility. 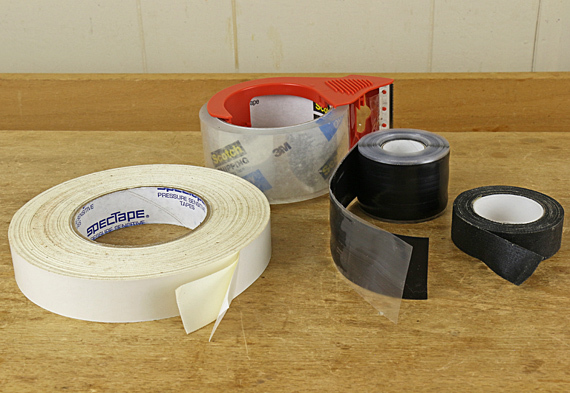 I prefer SpecTape ST-555H 1″-wide (Woodcraft item #15D25). This is a tough cloth tape with strong adhesion, yet it removes cleanly. It has a stiff, smooth paper backing that is easy to remove. I have used other tapes with soft paper backings that were annoyingly difficult to remove. Bandsawing legs with three-dimensional curves: For taping the waste back on to restore the layout lines, double-stick works much better than wrapping tape around the leg. Mock-up designs: Lightweight parts can be rearranged easily. Bandsawing curves in wide boards: Tape an extra squared board to the back of the work piece for stability. Here’s an efficient way to work with this tape. 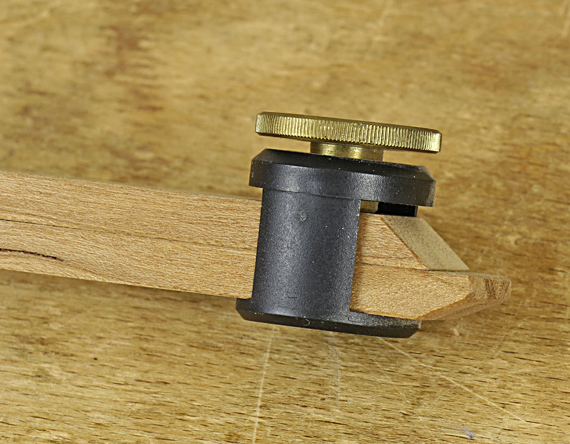 While applying the piece of tape to the wood, fold up a tiny corner to create a little “ear” of separated backing. Rub your fingernail over the main area of the backing paper to seal down the tape. Then grab the ear to pull away the backing. This works well as a glue barrier. For example, I wrap tape on the tops and upper sides of the wooden support strips used for gluing up panels. The forms and clamping blocks for bent lamination work also get covered. Oh, and of course this is essential equipment for returning that tool you bought that didn’t turn out to be as cool as it looked in the online catalog, or that, nope . . . ya just don’t need. I wrap, hockey style, my coping and fret saw handles with Ace Hardware black Cloth Friction Tape to greatly improve my grip and reduce hand fatigue. I also flat wrap some clamp handles such as the outer handle on wooden hand screws. This stuff is grippy without being too rough on your hands, as can be anti-slip tapes. It can leave a bit of black residue on your hands when new, but not significantly as the wrapping inevitably gets sprinkled with wood dust. It does not leave sticky residue on your hands. This interesting stuff stretches a lot and bonds to itself without adhesive. It is useful for some dust collection fittings where it makes a nice tight seal. However, it really only sticks well to itself, and therefore needs contour on both parts of the fitting that it can tightly conform into, and so create a mechanical lock.